We've now made this galette two times in the last three days. I'm normally the kind of person who dislikes repeating tastes: I like to rotate my flavors, spices, and kinds of meals, with Indian flavors one night and Asian inspirations the next. And as much as I try, I still can't get into so-called standard lunches like peanut butter sandwiches for lunch everyday. 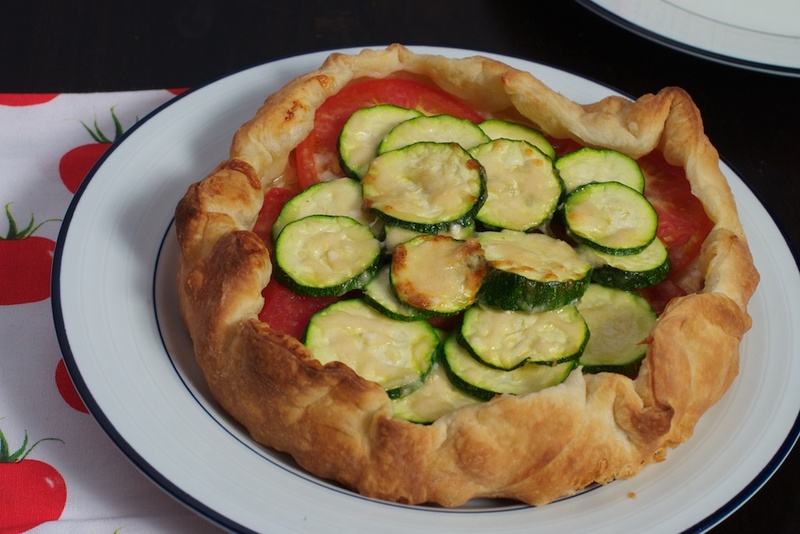 All this serves to say: this galette is a taste I have no problem repeating. 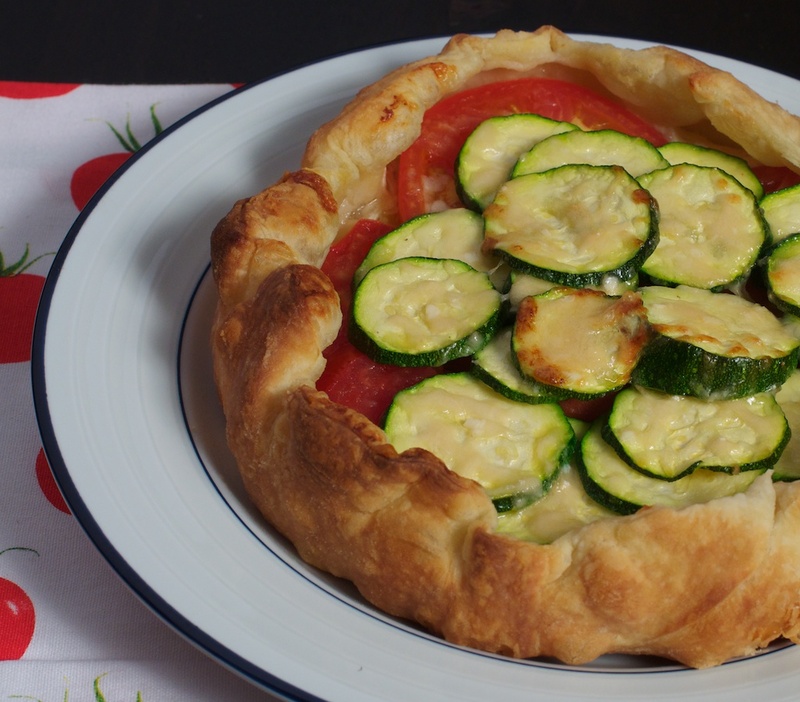 Fill the galette with sauteed leeks, sliced tomatoes and zucchini, and shredded Parmesan, bake for 20 minutes, and dig into your own deconstructed vegetable pizza. I've been relying lately on Dufour's versatile puff pastry, which works just as well in desserts as entrees. You can certainly feel free to make your own galette dough (see previous galette posts for recipe inspiration), but when the weather's a sweltering 95 degrees, we've been focusing on creating satisfying tastes in less time. 1. Roll out the puff pastry to 1/16 inch thickness. Cut out a 12 inch round and place the round on a baking sheet that's been lined with parchment paper. Chill the dough until everything else is prepared. 2. Heat the olive oil in a saute pan. Add the leeks and a bit of salt and pepper. Cooking until the leeks soften, around 7 minutes. Transfer the leeks to a plate and let cool. 3. Preheat the oven to 450. Slice the tomatoes into 1/4 inch rounds before arranging them on a wire rack over paper towels or a baking sheet. Sprinkle with salt and pepper and let drain. 4. Slice the zucchini into 1/6 inch rounds. In a bowl, mix the slices with 1 tablespoon of olive oil, salt, and pepper. 5. In another bowl, combine the ricotta with a tablespoon of olive oil and salt and pepper to taste. Squeeze each clove of garlic into the bowl and mix until smooth. 6. Remove the dough from the refrigerator and spread the ricotta over the bottom, leaving a 1 inch border. Follow with a smooth layer of the leeks. Arrange the tomatoes over the leeks and arrange the zucchini slices over the tomatoes. Sprinkle with Parmesan before folding the border up and over the edge of the tomatoes. 7. Bakes for 20 minutes, until the pastry is golden and puffed. 8. Remove from the oven and let cool for 5 minutes before slicing and serving. I’ve struggled with the concepts of change and control for as long as memory serves. 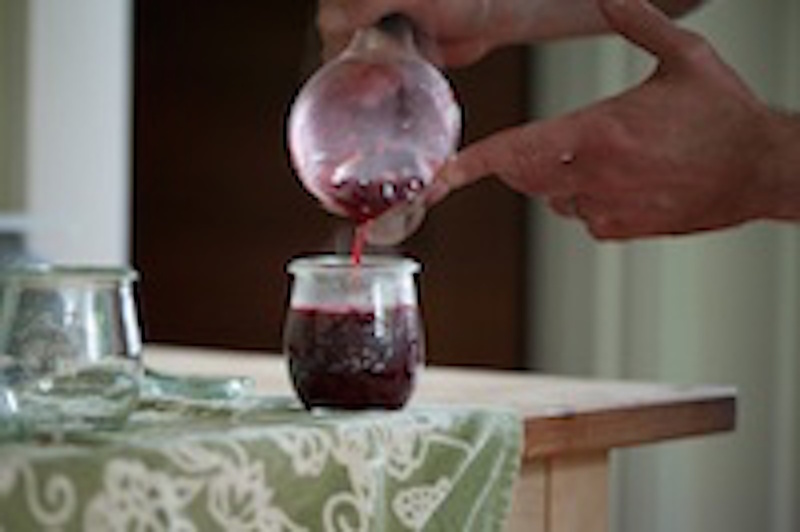 In the summer, the words “Oregon” and “berry” are practically synonymous.